Tomato contains a high level of lycopene, a powerful antioxidant that has marvelous benefits for the skin. Lycopene protects skin from ultraviolet rays, thereby delaying skin aging and protecting against skin cancer. Tomatoes can do wonders for your skin when included in your beauty routine. Tomatoes possess antioxidant qualities, their topical application can stop skin damage on the cellular level. They also have a high level of acidity inherent in their juice. This acidity will dry the skin when tomato products are applied to acne patches and tighten pores on your skin that leak oil which causes acne. This also helps to slow the eventuality or entirely stop break outs from happening. 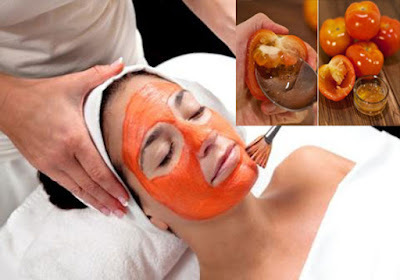 Tomato pulp on is helpful in removing acne and pimple scars. Tomato is considered very effective in shrinking large pores on acne prone skin. Being a rich source of lycopene, tomatoes help your skin absorb more oxygen, which delays skin aging and makes it less prone to wrinkles. Also, drink a glass of tomato juice daily to nourish your skin from within.